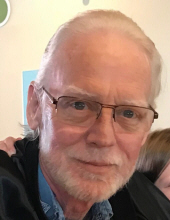 Michael T. Sheley, 63, of Silvis, passed away peacefully, March 17, 2019 at Illini Restorative Care, Silvis. Per his wishes, cremation rites will be accorded. Schroder Mortuary is assisting the family with arrangements. The family would like you to come and celebrate Mike’s life, from 12:00 PM to 4:00 PM on Saturday, March 23, 2019 at the East Moline American Legion. In lieu of flowers, the family requests memorials be made to; The Cure Starts Now 10280 Chester Rd. Cincinnati, Ohio 45215. Mike was born December 23, 1955 in Silvis, the son of Richard and Betty Ohrberg Sheley. He married the love of his life, Debbie, they divorced but always remained close. Mike worked for several companies including John Deere, East Moline Metal and Goedecke. Most recently he was employed at the Davenport Library and made great friends there. Mike enjoyed spending time with his family and friend. He was a devoted father and a proud papa to his grandchildren. He enjoyed fast cars, riding horses and was a talented carpenter. He was a man of few words but many attributes, he will be greatly missed. Mike is survived by his father, Richard and stepmother Lois, his daughters, Kara (Robert) Storey, Jessica (Gregri) DeGrange; siblings, Kathy (Tim) Hughes, Joyce Bryant, and Don (Lori) Sheley; grandchildren, Norah, Kylah, Garrett, Myles and Giuliana. To plant a tree in memory of Michael T Sheley, please visit our Tribute Store. "Email Address" would like to share the life celebration of Michael T Sheley. Click on the "link" to go to share a favorite memory or leave a condolence message for the family.